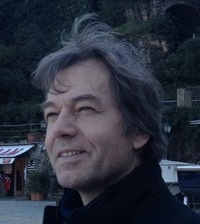 Claus Larsen was born in Copenhagen in 1954. He started painting early and showing in galleries in Copenhagen. At the same time, he was drawn to medicine, and graduated in Medicine and Surgery at the University of Copenhagen. He then moved to Milan to work as a medical and scientific illustrator, thus reconciling his interest in art and medicine. Teaching scientific illustration became a further interest. Since the early 90's he has been invited to lecture at universities in Milan, Bologna, Lucerne and Zurich. In 2007, Zanichelli published his book "Artistic Anatomy", using digital technology like 3-D graphics to allow the reader to investigate anatomy through higly realistic volumetric models. From 2007 to 2013 he has been president of AEIMS, the European Association of Medical and Scientific Illustrators. In 2009 Claus Larsen decided to start showing his art work, and he has had exhibitions with galleries in Italy and abroad. 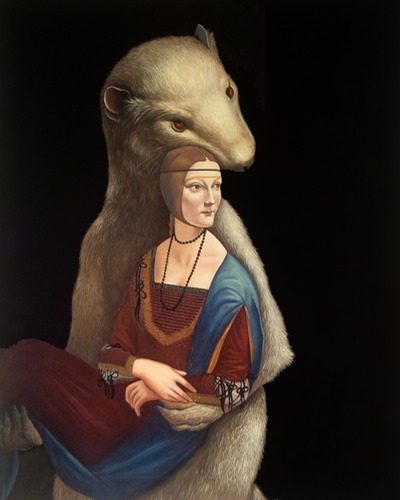 It's not The Lady with an Ermine, but The Ermine with a Lady. In Larsen's work, famous paintings undergo a surprising metamorphosis, where commonplace becomes a no-man's-place. Magritte and Dalì are distant relatives of the progeny of Larsen's mind, in which what meets the eye is less than ever to be believed. He creates a realm of imagination, a visionary zoo, where ducks, penguins and toucans teach from a flying pulpit that everything is fluid, everything changing. And in nature, change is the only law that doesn't change. Larsen paints with clarity, to show us that things are ambiguous; the worlds he paints are presented with super-precision, to remind us that all we rely on is unreliable.This is a surrealism of delicate, humorous forms, as must be when the lesson comes, not from a Freud or a Lautréamont, but from the squirrel's little snout. But, of course, we need not see these works as surrealistic. There is no need to get caught up in the snares and blind alleys of Larsens images. We can bypass the nonsensical hidden meanings and just (just?) experience his meadows and his skies, where the clock doesn't keep time, as winter follows spring and dawn breaks at midnight. We are at home in these bright, contradictory worlds, for none of us, none, needs factuality, but rather truth. Not reason, but contradiction governs our lives. The only way to undestand anything, is to realize we understand nothing.